My Mud Australia baby noodle bowls arrived (and did not disappoint). I couldn’t wait to use them for a baked dessert: what to bake? I knew right away where to look. 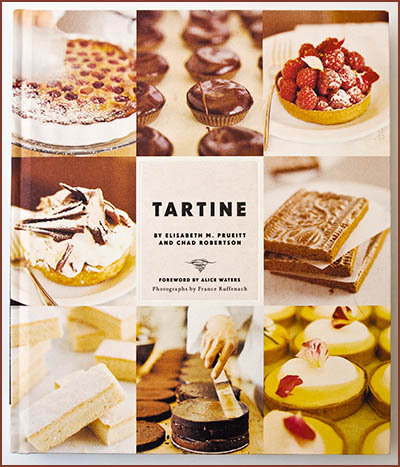 I recently purchased a very lovely dessert cookbook from Tartine Bakery in San Francisco. Everything about the cookbook is appealing: it’s printed on delicious, thick, matte paper and has wonderful, mouth-watering photographs (my only complaint is that I wish there were more). It’s full of great recipes for sophisticated basics, most of which appear to be fairly easy to prepare. I knew it would not disappoint when I saw that Alice Waters wrote the foreword. I can’t wait to try their brioche bread pudding recipe (always looking for a good bread pudding) and some of their savory baked goods are very tempting too. 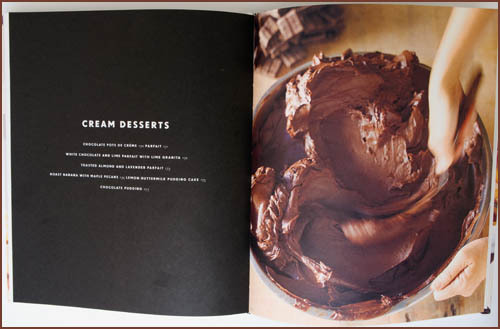 The book is organized by theme (each chapter introduced by an explanatory foreword) and there is an entire chapter devoted to cream desserts that immediately drew me in. The chocolate pot de crème recipe (a baked pudding like a sophisticated flan) seemed like the perfect inaugural dish for my pretty little bowls. I’m also excited to try a classic chocolate pudding, a molten chocolate cake, and individual mini soufflés (if I can muster up the courage). The dessert was very quick to assemble and fit into six baby noodle bowls perfectly. I shared all but one with neighbors and got great feedback. 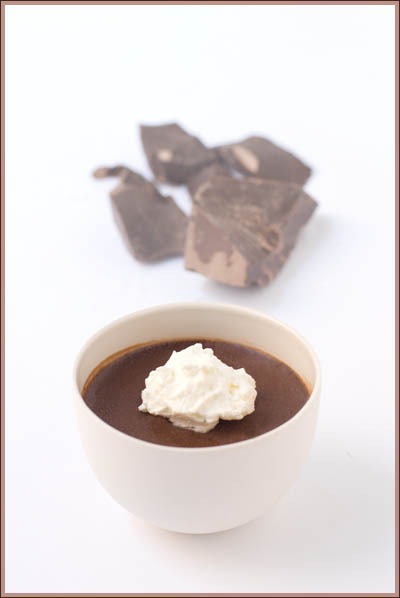 After all, who doesn’t like a creamy chocolate pudding? I served it with unsweetened whipped cream. You can make the desserts ahead and easily refrigerate them for several days. They can be served warm or cold. For me, the pretty bowls made the dessert! I am a sucker for simple, white pottery with thin walls and an organic feel. There are so many beautiful hand-made porcelain and ceramic vessels I have discovered recently and would just love to collect. I have to hold myself back from loading up. For another beautiful alternative to the simple Mud bows, check out the oven-safe bowls by White Forest Pottery here. To check out a few other discoveries, see Anne Black’s pottery (particularly the tilt bowl) and Nathalie Derouet's line - so lovely! Preheat oven to 350˚F. Have ready custard cups or ramekins. Choose a baking pan or baking dish for a water bath large enough to accommodate custard cups or ramekins without touching, and deep enough to hold water that will reach three-fourths of the way up the sides of the molds once they are added. Pour enough water into the pan to reach about halfway up the sides of the pan, and place the pan in the oven while it is heating. Pour water to a depth of about 2 inches into a saucepan, place over medium heat, and bring to a gentle simmer. Select a stainless-steel bowl (or other heat-proof bowl) that will rest securely in the rim of the pan over, not touching, the water. Put the chocolate in the bowl, place over the water, and heat, stirring occasionally, until the chocolate melts and is smooth. Remove from the heat. Meanwhile, in a small saucepan, combine the cream, sugar, and salt, place over medium heat, and heat to just under a boil. Place the egg yolks in a mixing bowl and whisk until well blended. When the cream mixture is ready, remove it from the heat and slowly pour it into the melted chocolate, whisking to incorporate. Slowly add the chocolate-cream mixture to the egg yolks, again whisking well to incorporate. Pour through a fine-mesh sieve into a pitcher or large measuring cup. You should have about 1 quart. Line up the custard cups or ramekins on the countertop, and pour the mixture into them, dividing it evenly. Pull out the oven rack holding the water bath and place the molds in the bath. Pour in more water if necessary to reach three-fourths of the way up the sides of the molds. p.s. Coincidentally, the current Sugar High Friday food blogging event's theme is "pudding" so I've submitted this post for the roundup which is being done by Kochtopf. Absolutely gorgeous. My dream is to one day own some White Forest Pottery of my own. Their work is sublime. That is a beautiful presentation. Perhaps you could make it again in late December just to confirm the recipe ... hint! gorgeous! and i always use my leftover egg whites -- it's much more difficult to find uses for the leftover egg yolks! Usually it involves some lusciously decadent dessert. :-) Like this one! Lovely bowl indeed, and the pudding sounds so decadent and delicious!! I like the bowls too and the pudding looks so delicious! Thank you for your first entry to Sugar High Friday! Such a beautiful presentation! So spare and yet seductive-- from the raw material to the finished confection. YUM! So simple, but so beautifully done. Maryam: I'm working on that too! Katy: definitely - ice cream or pudding! I SO want this cookbook! This dessert looks so perfect in you new bowls!! Mmmm... so deliciously presented and descrined.